In some respects, gigabit connectivity is not a new development. The US scientific community has been using hyper-fast networks for several years, changing the pace of data sharing and enabling levels of collaboration in scientific disciplines that were unimaginable a generation ago. In 2014, Google and Verizon were among the innovators announcing that they are testing the capabilities for currently installed fiber networks to carry data even more efficiently—at 10 gigabits per second—to businesses that handle large amounts of Internet traffic. There is less contention over what expanded capabilities will mean when they evolve. Historically, every major advance in bandwidth has facilitated innovation that has brought new services and applications to digital life. In the Internet’s early days, slow modems facilitated email; faster dial-up modems helped websites become useable; early broadband rollout allowed for quicker sharing of relatively big files such as the MP3 music files that were shared on the first peer-to-peer services like Napster; later broadband advances allowed for streaming activities that have given rise to services like YouTube, Amazon Prime, and Netflix; and advances in wireless speeds have enabled everything from massive adoption of social networking sites to location-based sharing services on smartphones. 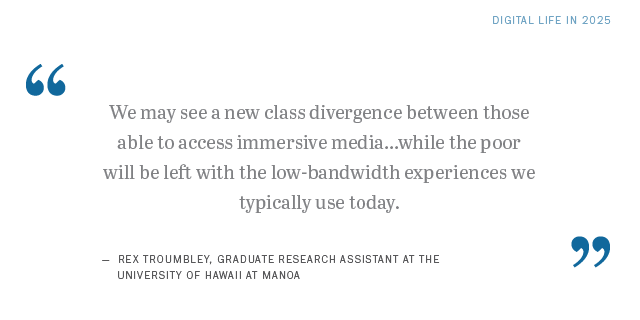 The respondents to this canvassing foresee similar changes as gigabit connectivity emerges. Please elaborate on your answer: If you answered “no,” explain why you think there will be incremental change, or hardly any change at all. If you answered “yes,” describe what the killer apps might be as gigabit connectivity becomes available. Explain what new tools and applications will excite people in the next decade and envision the kinds of personal connectivity and immersive media experiences that will seize the public imagination. Some 86% of the respondents to this non-probability survey said “yes,” they believe major new applications will accompany a rise of bandwidth speeds in the US by 2025, and 14% of the respondents said “no.” There were a number of broad themes threaded through their answers. Many of the respondents expanded the frame of the question and discussed advances that are generally tied to the Internet of Things—the spread of connected devices, artifacts, sensors, and wearables—and other technology trends. Following is a selection of respondent answers that speak to each of the themes. Theme 1) People’s basic interactions and their ability to ‘be together’ and collaborate will change in the age of vivid telepresence—enabling people to instantly ‘meet face-to-face’ in cyberspace with no travel necessary. As the boundary between being “here” and being “there” shrinks, respondents predict that people will be able to experience faraway places, sounds, and smells without actually being there. Theme 7) Advances will be gradual for various reasons: Bandwidth is not the issue. The US will continue to lag by 2025 because a widespread gigabit network is not easily achieved.